Sometimes I like the blog to share useful and practical information, as well as style and design tips. Today’s post has some great advice for maintaining a pest free shed! Sheds are vital parts of the garden for many households, and you’ll want to keep your outbuildings in good condition so they last for years to come. Pests can pose a range of problems for sheds, so read our useful guide to avoiding pests. Rodents live in both rural and urban areas, but you can avoid attracting them to your garden by following a few simple steps. If you’re aware they’re already visiting your outdoor space or your shed, there are measures you can take to prevent them returning. 1. If you use your shed to store items that smell, keep them in airtight containers. Odours can attract rodents in search of food. 2. Prevent pests from entering your garden in the first place by ensuring there are no gaps in the periphery hedges or fences. If there are holes, fill them with pieces of wood. 3. If you have a problem with rats or mice, invest in humane traps so you can catch the rodents and release them somewhere far away. 4. To prevent rodents from getting into your shed, consider insulating the building. Fibreglass is commonly used to insulate wooden sheds. Insects are a part of wildlife that you can’t really avoid, but there are ways of keeping bugs, flies and beetles out of your shed. Woodworm, greenfly and ants are all common problems you don’t want to have to deal with in your pest free shed, so the best tactic is prevention rather than cure where possible. 1. If you store clothes in your shed, make sure you use plenty of mothballs to deter moths from discovering and potentially ruining the garments. 2. Invest in special sprays that will repel or kill insects without damaging any plants you’re growing in your shed. You can usually spray these liberally all around the inside of the building, paying particular attention to any holes or gaps in the shed’s walls. 3. Pack bags of fertiliser in extra layers; the smell from the fertiliser can be a magnet for insects, so making it less easy for the scent to escape should reduce your chances of attracting unwelcome insects. 4. Ants are common garden pests, and you can invest in special powders to deal with the insects. Alternatively, draw a chalk line around the shed on the ground – the ants won’t want to cross the line, so you can solve the problem humanely. 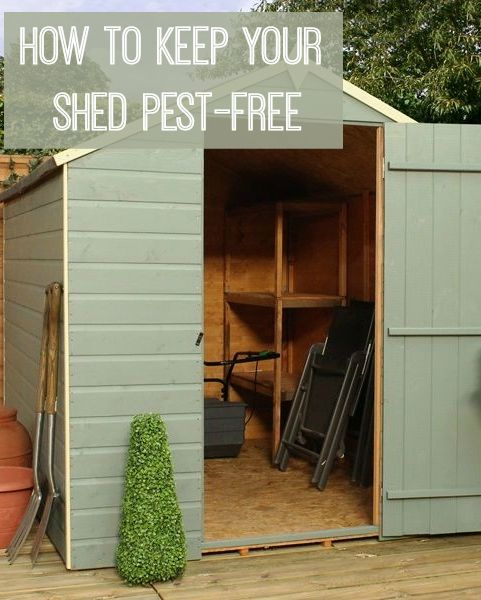 A great tip for a pest free shed! 5. Woodworm is actually a type of beetle that burrows into wood and eats it, causing damage to buildings like sheds. The problem tends to occur in humid sheds, so ensure the building is well ventilated and perhaps invest in a timber moisture meter with a probe. As long as the reading is below 12 per cent, woodworm shouldn’t be a problem. If you’re concerned the shed might have or contract woodworm, you can install a UV insect killer that will eradicate emerging adult beetles in spring and summer. If the woodworm has already consumed the building, it might need treating with the chemical boron, or it may be time to look at new sheds for sale and invest in a replacement. 6. Avoid attracting insects by painting or staining raw wood. This should also help prevent water seeping into the wood and making the shed rot. 7. Keep light sources in the shed to a minimum. Many insects are attracted to light, especially at night. 8. Fill gaps in your shed walls to prevent insects from entering and to keep a pest free shed. Try an expanding foam to fill holes and some silicone beads between shed panels. Have you found these tips useful? Good luck maintaining your pest free shed! Next Post What Makes The Perfect Home? I’ve found them really useful! I like the one about doubly wrapping the fertiliser so as not to attract unwanted guests by the smell. I have a lot of woodlice (which I hate!) in my allotment shed at the moment so will be following your tips. Thanks! Thanks for the useful information i know now what to do, on how to eliminate insect.